In late May 2015, my wife, Ethelle, and I went for a birding drive at Carlos Avery Wildlife Management Area, just north of the Twin Cities. We enjoyed seeing wood ducks, painted turtles, and a rare Blanding's turtle. But the highlight was the discovery of about 150 greater sandhill cranes feeding in marshy grasslands. I have followed the recovery of Grus canadensis tabida in Minnesota for nearly 40 years in my work as supervisor of the Nongame Wildlife Program for the Department of Natural Resources. This was the greatest concentration of cranes I had ever seen at Carlos Avery. In his essay "Marshland Elegy," Aldo Leopold wrote, "Our ability to perceive quality in nature begins, as in art, with the pretty. It expands through successive stages of the beautiful to values as yet uncaptured by language. The quality of cranes lies, I think, in this higher gamut, as yet beyond the reach of words." Sandhill cranes have many endearing habits. Their springtime ritual of "dancing" to attract a mate is captivating to watch. They mate for life, which can be 20 years or more. Both parents feed the young, which are called colts—probably because of their lanky legs. Crane species around the globe appear in folklore, art, and literature. In Japan the red-crowned crane signifies good health, longevity, fidelity, and good fortune. In China, cranes stand for spirituality, superiority, and wisdom. Statues of cranes are featured in the Forbidden City of Beijing. Because cranes can fly to great heights, Chinese legend considered cranes to be messengers of the gods who carried souls of the dead to paradise. Cranes can indeed fly high. Sandhill cranes have been documented flying at 8,000 feet. Watch the spectacle of thousands of cranes on the wing along Nebraska's Platte River where they stage each spring during their migration. Watching and listening to sandhill cranes is an awesome time-machine experience: Fossil remains of a crane from Nebraska go back 9 million years. This feathered survivor inhabited North America's temperate grasslands and wetlands in the company of now-extinct woolly mammoths, mastodons, giant beavers, camels, horses, and saber-toothed cats. 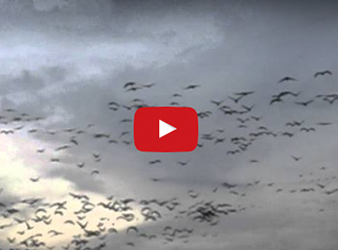 With sandhill cranes, we hear strident voices from the past. Their trumpeting, trilling, and rattling calls are again reverberating across the skies of Minnesota. Once common across much of Minnesota, sandhill cranes were among large birds like whooping cranes and giant Canada geese that were decimated by market and subsistence hunters during the 1800s. Cranes were shot at every opportunity from spring to fall. By the 1940s, no more than 40 to 50 cranes remained in Minnesota in the Duxby bog near Roseau. When conservationist Aldo Leopold wrote his essay "Marshland Elegy," he considered the sandhill crane to be a wilderness species: "The ultimate value in these marshes is wildness, and the crane is wildness incarnate." At that time the crane was a wilderness species, because remote places were its last stronghold in an era of unchecked wetland drainage and excessive hunting. However, sandhill cranes had a surprise for us: resilience! Given adequate habitat and protection from poaching and overharvest, cranes can get along quite well in the presence of modern agriculture and urbanization. They recognize good habitat—a matrix of shallow wetlands, surrounding grasslands, pastures, and small grain crops like wheat. And they respond with good survival and reproduction. The cranes we saw at Carlos Avery WMA were nonbreeding subadults that will reach breeding age when about 5 years old. Their abundance suggests a significant nesting population exists in the region, part of a statewide resurgence of this bird. State and federal protection has allowed sandhill cranes to stage a slow and remarkable recovery. The Minnesota population now appears to exceed 15,000. The greater sandhill crane is one of two species of cranes native to Minnesota. (The other is the larger whooping crane.) The greater sandhill crane stands about 4 feet tall, has a wingspread of nearly 7 feet, and weighs up to 14 pounds. Its body is usually medium gray. The crown of bare skin on top of its head is red on adults. Young and adult cranes may appear rusty in appearance because they sometimes "paint" their plumage with iron-stained clay. When I was hired as nongame wildlife supervisor, one of my first projects was to determine the status and distribution of sandhill cranes. A volunteer network of about 60 observers reported to me for three years. I concluded that the statewide population was approximately 1,500 cranes in 1979. The crane surveys revealed two populations of greater sandhill cranes in Minnesota: east-central and northwestern. The east-central population reflects the expansion of cranes from western Wisconsin into Minnesota during the past 30 to 40 years. Those cranes nest in marshy habitats from Aitkin, Carlton, Pine, Morrison, and Crow Wing counties south to the Iowa border. They migrate to wintering areas with a mix of pastureland, pine plantations, and wetlands in Indiana, Kentucky, and Tennessee. Some of them also winter in Georgia and Florida. Native greater sandhill cranes also nest in at least 11 counties of northwestern Minnesota. That flock is part of the midcontinent population that includes lesser sandhill cranes (Grus canadensis canadensis) that nest from Siberia to the central Canadian Arctic. It also includes Canadian sandhill cranes (Grus canadensis rowani) from prairie provinces. Many cranes stage in northwestern Minnesota in mid- to late October before their fall migration to Texas, Oklahoma, and northern Mexico. The recently completed Minnesota Breeding Bird Atlas and the DNR Minnesota Biological Survey both document the current distribution of sandhill cranes in Minnesota. When compared with the 1979 distribution map, these survey maps demonstrate an incredible wildlife success story. Count totals for the past three years show an average of 5,000 cranes in the northwest. In fall 2015, more than 11,000 cranes were counted at Sherburne National Wildlife Refuge. It seems likely that most of those cranes are residents, since most Wisconsin-origin cranes would likely stage at Crex Meadows Wildlife Area in Wisconsin. The increase of crane numbers in east-central Minnesota has given rise to two major studies on sandhill crane ecology, distribution, survival, and migration patterns by University of Minnesota graduate students David Fronczak and David Wolfson. These researchers have observed that ranges of the northwestern population and the east-central population have expanded and now merged in central Minnesota. It will be interesting to learn what wintering areas these cranes select. As crane populations increased, farmers voiced their concerns about crop depredation on agricultural lands. In spring when newly planted corn is sprouting, cranes pluck the sprouts from the ground and eat the kernels of corn. To address this problem, the International Crane Foundation in Baraboo, Wis., worked to develop a federal license for a repellent to treat seed corn. The repellent, Avipel, is nonlethal, with an active ingredient called anthraquinone. 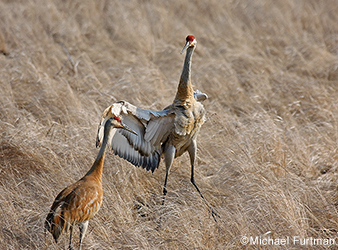 Sandhill cranes find seed corn treated with anthraquinone distasteful and learn to avoid it. Although cranes avoid eating treated corn, they remain in the cornfield to feed on crop pests such as white grubs and caterpillars. The Minnesota DNR Nongame Wildlife Program assisted the crane foundation with getting Avipel licensed for use in Minnesota. The U.S. Fish and Wildlife Service authorized hunting of cranes in 1961 for the midcontinent population, which includes cranes in northwestern Minnesota. A plan for a hunting season was proposed and implemented by the DNR in 2010. Fewer than a thousand hunters sought cranes in Minnesota in 2010, and they took 830 cranes. Since then the number of hunters has declined. In 2014 the number of active hunters was 401, and they took 247 cranes. Sandhill cranes are exceptionally wary and have excellent eyesight, so they have proven to be a challenging quarry for hunters. Public concerns about the impact of the crane season in the northwest have subsided as the DNR has demonstrated its concerns for sustaining the population. The agency added a northwest crane breeding population survey and adjusted the hunting season to better manage the population and ensure that overharvest is not a threat to the long-term survival of the cranes. People have shown increasing interest in viewing cranes. The cranes' graceful flight, captivating calls, impressive flocks, and dancing traditions in spring can mesmerize even the most casual of nature enthusiasts. Cranes are a powerful attraction for nature photographers. The opportunity to see and enjoy sandhill cranes is better every year at locations near the Twin Cities, including Sherburne National Wildlife Refuge. Detailed records from the refuge provide dramatic insight into what is happening in eastern Minnesota. The first record for nesting sandhill cranes occurred in 1975. By 1990, 20 pairs were nesting at Sherburne. It appears that the refuge has reached its carrying capacity with 35 to 45 pairs in the annual count since 2008. Sherburne also emerged as a major fall migration staging area for cranes. The fall count rose from 87 cranes in 1987 to 8,797 in 2014 and 11,331 in 2015. That is certainly enough to attract quite a crowd of crane enthusiasts. When I wrote "Last Call for Cranes" for this magazine in 1979, I was encouraged by their steady increase and range expansion. But I was concerned about their prospects for a continuing recovery. It seems I underestimated their incredible resilience. No longer a rarity, sandhill cranes are fairly widespread and common across much of the state today. My new message: Enjoy the cranes! They are a wonderful gift from the past. Their recovery reminds us of our continuing stewardship responsibility for all of Minnesota's native birdlife.